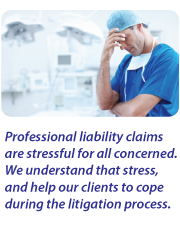 For more than 20 years, we have been involved in medical malpractice litigation. Some of our attorneys have experience handling these cases on both sides of the bar, having handled claims for both patients and medical professionals. Hospital claims we have handled range from nursing failures related to charting and reporting, misadministration of medications, improper physical contact with patients, and failure to restrain patients at severe risk of a fall. We have handled these same claims in the context of nursing homes as well, and in that context we have also handled cases of elder abuse, bedsore cases, nutritional deficiency cases and disputes regarding failure to transport or summon emergency medical care in the end-stages of life. We have also handled a significant number of employment cases for hospitals. We have served for several years in connection with the needs for separate personal counsel that often arise on the part of health care professionals when there is a potential dispute between the physician and his or her insurance company, or where the exists personal liability beyond what might be covered by insurance.